I vowed to make this website all and almost only about recipes or crafts using the muffin pan, but I couldn't resist this. I made soft pretzels today! Hooray for FUNemployment! Now I wish I could say that this was perfection on the first try but that would be a flat out lie hehe. This was one of those "third times a charm" moments. First time, dead yeast. (Don't you hate when that happens?) Second time, wrong kind of flour. Wheat flour does not work the same as all purpose flour. Noted. So third time...SUCCESS! Yummy, yummy success. -Combine the water, sugar, yeast, and butter in a large bowl. Let sit for 5 minutes. -Add the salt and flour and mix with a wooden spoon until combined. Keep mixing until the dough begins to pull away from the side of the bowl, about 3 to 4 minutes. If the dough appears too wet, add additional flour, 1 tablespoon at a time. Remove the dough from the bowl, place on a flat surface and knead into a ball with your hands. -Oil a bowl with vegetable oil, add the dough and turn to coat with the oil. Cover with a clean towel or plastic wrap and place in a warm spot until the dough doubles in size, about 1 hour. Preheat oven to 425f. -Bring the water to a boil in a small roasting pan over high heat and add the baking soda. -Remove the dough from the bowl and place on a flat surface. Divide the dough into 8 equal pieces, about 4 1/4 to 4 1/2 ounces each. -Roll each piece into a long rope measuring 22 inches and shape. 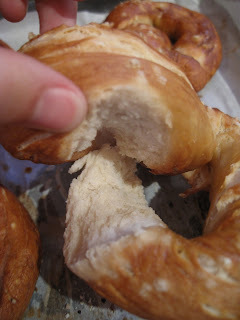 Cut the dough into one inch pieces to make the pretzel bites or shape each rope into the pretzel shape. -Boil the pretzel bites or large pretzels in the water solution in batches. I did about 20 pieces or 2 whole pretzels at a time. Boil for about 30 seconds. -Remove with a large slotted spoon. 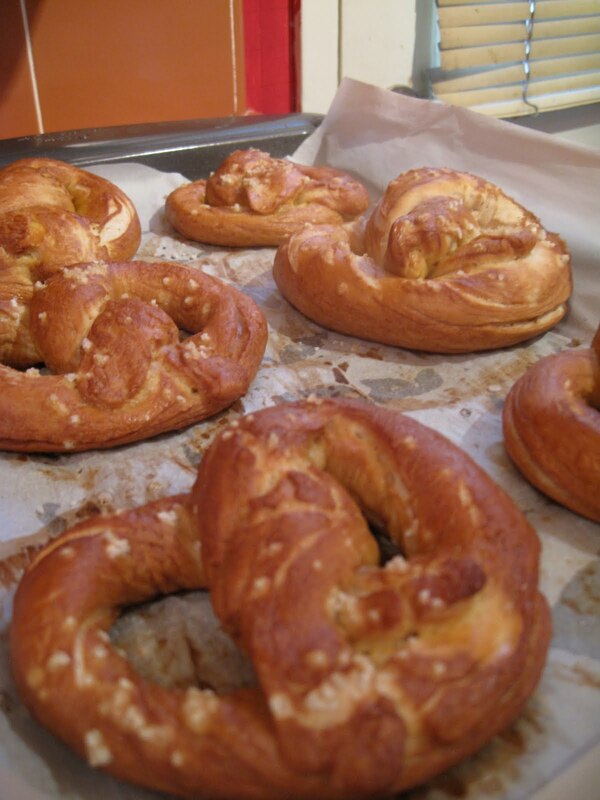 Place pretzels on a baking sheet that has been covered in parchment or sprayed with cooking oil. Make sure they are not touching. -Brush the tops with the egg wash and season liberally with the salt. Place into the oven and bake for 15 to 18 minutes for the pieces or 35 minutes for larger pretzels until golden brown. -Remove to a baking rack and let rest 5 minutes before eating/shoveling in your mouth! The mini pretzel bites were yummy - you can make more of those please!